A model of blended learning rarely looks the same across classrooms. The models of course aren’t designed to be molds but to be guiding choreographies for a teacher and her students—and inevitably those individuals bring ingenuity to the craft as they improvise to create deeper and more customized learning opportunities. In the case of one 4th-grade teacher in District of Columbia Public Schools highlighted in our latest case study, her blended-learning approach often dances skillfully between models to help her class become stronger, actively engaged learners. Kaila Ramsey, a 2016 Education Innovation Fellow and math teacher at H.D. Cooke Elementary, had used the Lab Rotation and Station Rotation models for several years. Her model had consisted of a simple rotation between whole-group instruction and online time, where all of the students would pull out their laptops or move into a lab to use ST Math two days a week. Stations or learning centers were used on other days, where students would rotate between learning activities and teacher time throughout the class period. She had always preserved whole-group time each day in order to maintain inquiry-based learning and help students work together collaboratively to solve a single problem. Ramsey appreciated that data from online programs like ST Math might provide some clues, but she needed a temperature gauge at other stations to truly understand which stations and activities helped her students to learn. To accomplish this, Ramsey put her students on one station per day where they would spend 30 to 45 minutes either working with the teacher, working online, or working on independent work. Additionally, at the independent work stations, she began to offer multiple activities from which students could choose. This way, Ramsey could identify which specific activities were helping her students progress. It was at this juncture that she recognized a powerful yet underused source of information on students’ learning: her students. “I realized, they can easily tell you what they know and don’t know. They know their strengths and weaknesses,” Ramsey said. Taking that into account, she developed a peer-to-peer station where a student struggling with a particular skill or standard could partner up with a student who had really mastered that standard. Ramsey posted a dashboard in the classroom that let students both keep track of concepts they understand or need support with and quickly match up with a classmate whom they could could help or seek tutoring from. “I had students every day write their name down next to certain concepts they were struggling [with] or succeeding in,” Ramsey described. “That way they would know what they needed to be working on and who could help them.” In the peer-to-peer station, both students recorded and showed their own work on a worksheet, allowing Ramsey to view each student’s progress during that station. Ramsey has adapted her model accordingly, carving out more choice in each daily station. She created a mock personalized learning platform in the learning management system Canvas where students could view their teacher-tailored options of assignments and select the stations they worked on. “We now have weekly check-ins on Wednesdays where we are looking at their data, conferencing, and I can help guide their activities for the rest of the week,” Ramsey added. The platform has also started solve Ramsey’s challenge of not knowing what modality was working—and it makes the path to progress transparent to both teacher and student. “[The students] see the results of their choices at the end of the week, see when their peers are doing better, and understand why,” Ramsey said. Today, Ramsey’s class generally spends three days a week working through complex problems with an inquiry-based approach to learning. On these days, students are presented with a complex problem, and after working in small groups and as a whole, they apply concepts they have recently learned to piece together a solution. On non-inquiry days students work at stations where they can self-select the activities they perform at each station, including both individual work activities and peer-to-peer instruction. Through her classroom model, Ramsey aims to help students develop self-management skills while still learning content, particularly given that her students stand to benefit from extra noncognitive learning support. Though before the fellowship Ramsey wrestled over time with how much free choice to offer students, she now believes that giving students choice not only boosts their engagement, but also empowers them to be active, self-directed learners. 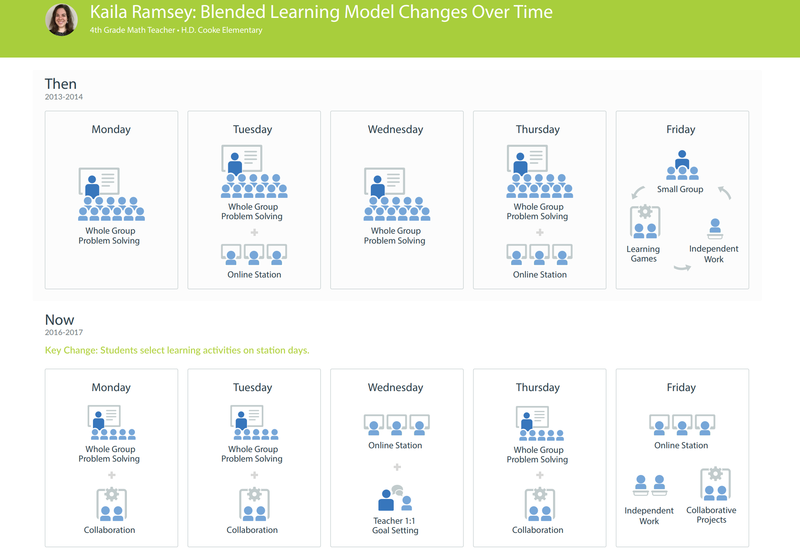 Ramsey’s journey with blended learning is one of five stories from District of Columbia Public Schools and Bella Romero Academy featured in the Institute’s latest case study, “Blended (R)Evolution: How 5 teachers are modifying the Station Rotation to fit students’ needs”. To see what other districts around the world are doing with the Station Rotation, explore the Blended Learning Universe.